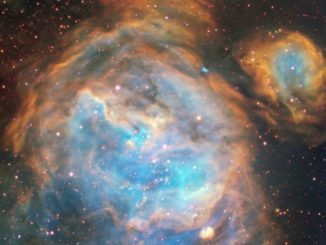 Vast bubbles of ionised hydrogen gas are illuminated by hot young stars in gargantuan stellar nurseries like this one in the nearby Large Magellanic Cloud. This complex assembly of bubbles is host to a wide variety of objects, including one massive stellar object emitting a 33-lightyear-long jet. 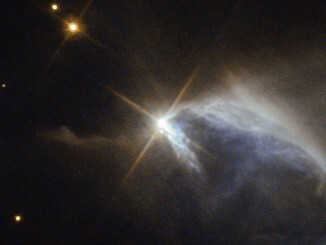 Surrounded by an envelope of dust, the subject of this NASA/ESA Hubble Space Telescope image is a young pre-main-sequence star known as HBC 1. The star is in an immature and adolescent phase of life, hence its classification — most of a Sun-like star’s life is spent in a stage comparable to human adulthood dubbed the main sequence. Just in time for the release of the movie “Star Wars Episode VII: The Force Awakens,” NASA’s Hubble Space Telescope has photographed what looks like a cosmic, double-bladed lightsabre. 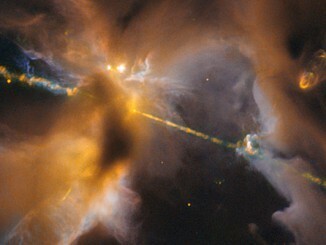 In the centre of the image, partially obscured by a dark, Jedi-like cloak of dust, a newborn star shoots twin jets out into space as a sort of birth announcement to the universe.